OERu courses are created for self directed study. This does not mean however, that you are on your own. In this section, we distinguish between general support and course specific support. General support resources and associated forums are used for non-course related queries. There is a good chance that your question has already been answered by someone else. There are two places you should consult on forums.oeru.org before posting a request for support. 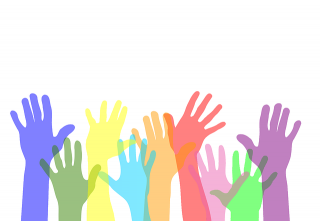 As a volunteer support community, if you know the answer to a question, help your peers by posting a useful response and “liking” good answers. Step 1: Consult the OERu support website (this site) for general help resources. Step 3: Search the general support forum to see if your question has been answered. Step 4: Post your question in the relevant subsection of the general support forum on the forums.oeru.org web site. General information on how OERu works, how to register for a course and navigate a course web site. Help resources for using OERu technology including screencast videos. You can navigate directly to the FAQ category by clicking on the “all categories” pull down menu from the homepage on the forums.oeru.org site and selecting the FAQs category. FAQs originate from discussions in the general support forums thus OERu learners play an important role in developing this support resource. OERu colleagues monitor the support forums for the best answers to new questions and add these to the list of FAQs. This is a good place to start for finding answers to commonly asked questions. Remember, to use the search link to find if your question has already been answered. General: Questions and discussion that doesn’t fit into the the sub-categories above. Use the search feature to find discussions relating to your support question. If you don’t find any answers to your support question, post your support request (see below). If you don’t find an answer to your question after visiting the FAQs and searching the support topics feel free to post a new topic in the support forum. Select the appropriate category: Learning, Technology, Assessment or General. Click on “Why not create a topic” or reply to an existing post. As a volunteer support community, if you know the answer to a question, help your peers by posting a useful response. You may be surprised, but helping others will reinforce your learning too, so you will be helping yourself as well as a sister/fellow learner. And who knows they may reciprocate and help you in return. Another valuable contribution is to “like” good posts and responses by clicking on the “heart” under a post. This will help users and site moderators in identifying useful contributions using the “wisdom of the crowd”. If you have a course related question your first stop should be the respective course forum. The course forum URL is always given in the Start here page which is under the Startup menu. From the homepage on the forums.oeru.org site, click on the search magnifying glass and use the course code plus “general” as your search term, for example: “LiDA101 general”. From the homepage on the forums.oeru.org site, click on the “all categories” pull down menu, select the courses category. Then select the “all in courses” sub-category to find your course listing. Alternatively you can go directly to the course forum with a URL like this: https://forums.oeru.org/tags/”’lida101”’ where lida101 would be replaced by your course code. 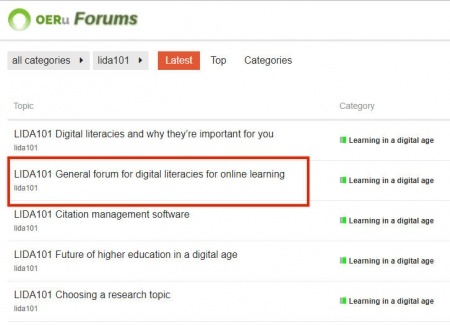 Select the forum called “General forum …” to ask any question about the course. Note there are also forums for specific parts of the course which you will be directed to as you go through the course.